Mr. Ozawa - a former leader of the Democratic Party of Japan - had been indicted for allegedly falsifying the accounts of his fundraising body to conceal its use as a slush fund for political donations. His aides had said the mistake was purely technical and their boss had not been aware of it. The Tokyo District Court today found the politician not guilty, ending a trial that had captivated Japan's political classes. 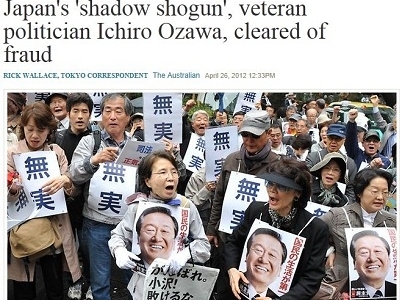 The verdict may be appealed by the prosecution, but the real interest now will be on Mr. Ozawa's likely attempts to regain influence in, or control of, the ruling party.